Chicago (AFP) – Otto Warmbier, the American student who died days after being released from North Korea in a coma, displayed no obvious signs of torture despite assertions by his parents and President Donald Trump, an Ohio medical examiner said Wednesday. The revelations came a day after Warmbier’s parents and Trump accused the reclusive regime of torturing the young man, who had been convicted of trying to steal a propaganda poster from a Pyongyang hotel. The parents, in a series of TV interviews Tuesday, said their son showed signs of torture, including teeth that appeared to have been “rearranged,” and hands and feet that were disfigured. After the airing of the interview, Trump for the first time accused North Korean leader Kim Jong-Un’s regime of torturing Warmbier. 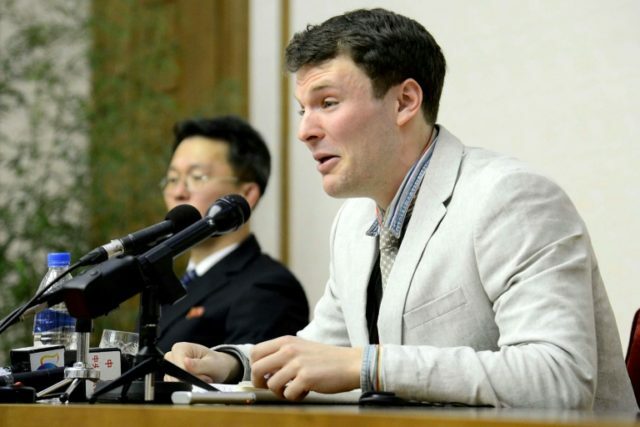 But Sammarco, who examined Warmbier’s body after his death in June, said there was no clear evidence of physical torture — including no recently broken bones or damaged teeth. Warmbier’s body displayed only a few small scars, all but one of which could be traced to medical instruments, she said, adding that the Warmbiers’ TV interviews had prompted her to publicly reveal her findings. “They’re grieving parents. I can’t really make comments on their perceptions,” she added.